WinX DVD Ripper Platinum is a fast and easiest DVD ripping solution that allows users to easily rip DVD movies from a disc, folder or ISO image and convert them into popular video formats without quality loss. 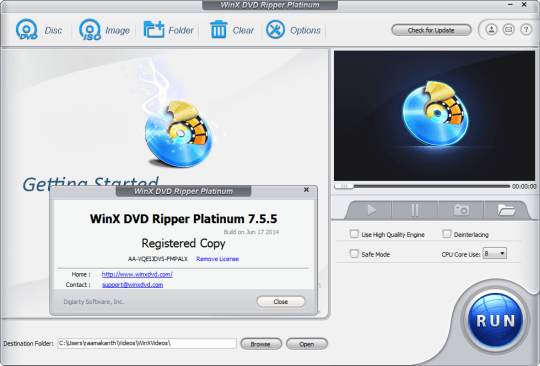 WinX DVD Ripper supports most common video formats for computers, mobile phones and portable media players in general. The application has a simple interface and its very easy to use, with just three steps users can can Rip and convert DVD movies. To rip a DVD, users have to select the DVD movies either from a folder or image or from a disc and select the desired output profile. WinX DVD Ripper Platinum offers a range of output profiles, which include common videos (MP4, AVI, MPEG, WMV & MOV), web video (YouTube, Facebook, Vimeo) and formats compatible with popular portable media devices (Android, iPhone, Playstation). The software also allows users to do a DVD backup by copying the full title content or main title , also you can back up a dvd by cloning it to a folder or ISO image. Furthermore, you can extract the subtitles, process DVD discs into ISO images and rename templates to organize output files. 1. Rip DVDs from disc, folder or ISO image. 2. Supports all DVD copy protections, such as Disney X-project DRM, Sony ARccOS, CSS,region codes and UOPs. Overall, WinX DVD Ripper Platinum is a professional DVD ripper software that will help you rip DVD’s, even the encrypted discs, clone DVD to ISO and convert DVD’s to popular video formats. Digiarty Software has started Super Summer Promo and offering free licenses of ‘WinX DVD Ripper Platinum’ for everyone until July 31, 2016. To get your own free copy of ‘WinX DVD Ripper Platinum’ , head over to this giveaway page and click the ‘Get Licensed Copy’ button, then click ‘ Get Giveaway Version’ to download the zip file. Extract this zip file, you will notice Winx DVD installer and a read me file with license code.Copy the license code , run the installer and launch the app, then enter license code to activate the application.